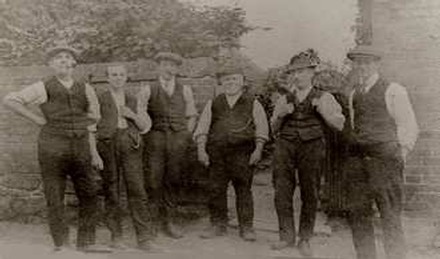 Left: A group of stockingers on Main Street 1880 - Right: A smaller group on Roe Hill 1910. Framework knitting developed as a widespread domestic cottage industry during the 18th and 19th centuries, particularly in the East Midlands. The inventor of the stocking frame knitting machine, William Lee, [see Buckland's History of Woodborough, Chapter X elsewhere on this website also Stockings and William Lee above] belonged to a Woodborough family but is said to have been Vicar of Calverton by 1589, the date generally accepted for its invention. Rev’d Lee was unable to get royal patronage from Elizabeth I because she feared it would be a threat to the legions of hand-knitters. In 1611 Lee took his invention to Rouen in France, but some of his workmen returned to England to establish the industry in London. Framework knitting was the main source of work in Woodborough from the time of its invention by Lee in 1589 until the early 1900’s. The industry was flourishing by the end of the 18th century and the population of Woodborough jumped from about 250 in 1750 to 800 by the 1830's. It was truly a cottage industry; most homes housed at least one hand frame-knitting machine with the whole family involved in ancillary processes (seeming and embroidering) of stocking manufacture. They worked from daylight until 10.0 o’clock at night for a very poor livelihood. Children from the age of nine years were employed usually in winding, but also seaming. These photographs were taken in Desborough’s factory at Sutton-in-Ashfield in 1947, and not Woodborough. 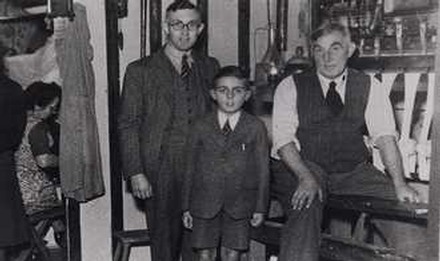 Left photo: Walter Desborough (seated), Stanley Desborough & Bryan Desborough (boy). Right photo: Walter Desborough on the right, the other person not known. Woodborough was one of the villages where a superior class of silk hose and hosiery seaming was still carried on much later. The scale of prices paid to stocking makers for work gradually declined from 1811 onwards. In 1833, earnings averaged six shillings per week on a narrow frame and from nine to twelve shillings on a wide frame. A framework knitters expenses per week were on average as follows: - rent one shilling and three pence to two shillings and six pence, depending on the size of frame, and needles were two pence, ½ lb of candles for 8 months of the year, three and a half pence. Oil one penny. Seaming one shilling and five pence. The workers were compelled to hire their frames from the master stockinger, who refused to employ any workmen who did not comply with the regulations laid down. From 1861 onward the application of steam power to the hosiery and lace-making industries began and gradually the men and women who had worked in their own homes moved into larger factories. The framework knitters do not appear to have welcomed this move, probably because it meant moving from their homes where in spite of being underpaid and often the victims of corrupt practices, they were to a large extent their own masters. 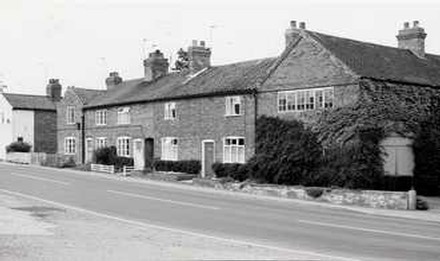 Above left: A row of former frame knitters cottages and right a frame shop on Bank Hill 1990.
and Sam Middup at a frame machine in Desborough’s factory in 1929.
the Roe Hill cottages were demolished in the early 1960’s to make way for old peoples bungalows. Gradually larger premises came into use as frame shops housing several frames and supported by frame smiths and specialists making the sinkers and needles. Woodborough still has many examples of cottages with the long windows needed to provide adequate light, and also a few frame shops. The largest concentration of cottages, a group on Roe Hill, were demolished in the early 1960's and replaced by bungalows for our older residents, but a good group of buildings remain at the bottom of Bank Hill where the end building, now a private home, was a frame shop. At the rear of 117 Main Street is a first floor workshop still retaining its upper sliding sash windows. 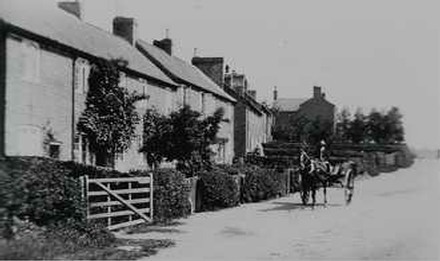 As late as 1844 there were 191 frames in the village (compared to the neighbouring villages of Calverton with 409, Epperstone 30, Lowdham 94, Lambley 381 and 56 in Oxton), by 1897 the number in Woodborough had dwindled, but it was recorded that there were still about seventy frames being operated. 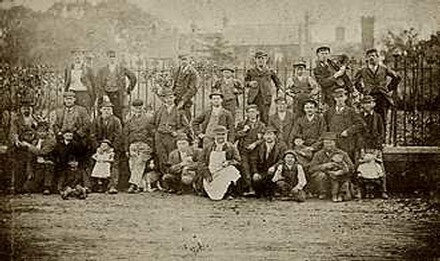 By this time the cottage industry was very much in decline with low pay due to increasing competition and the growth of factories powered by steam. By the end of the century the McKinley protectionist tariffs applied by the United States virtually killed the remaining silk hose trade. In response to the insecurity of the period for the frame knitters the Woodborough Male Friendly Society came into existence, gradually buying land for allotments for use by its members to allow them to supplement their incomes and support the families [see separate sections about the Male Friendly Society and the Allotments elsewhere on this website]. This in turn encouraged villagers to develop market gardening, which is today still a significant part of local industry. 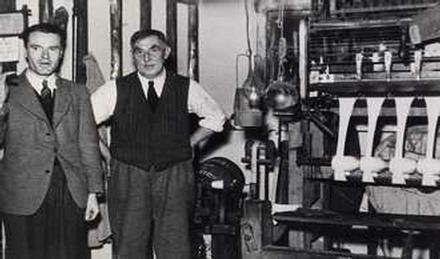 However, manufacture of silk ties and golf hose continued in Woodborough and developed to support Desborough's small factory in Shelt Hill, which continued until the 1942 when the firm moved to Macclesfield. 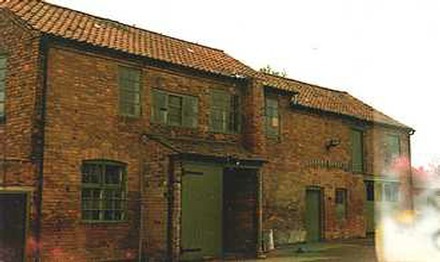 Surgical hose was made in the frameshop at the end of Field Lane, off Roe Hill. This was very specialized and made to measure, later it was moved to Hayward's factory in Warser Gate, Nottingham. Cottages (with at least one frame machine): Shelt Hill (also known as Dark Lane) nos: 2, 29 and 31, 67 to 81 (the latter ones were built by the owner of the Shelt Hill Factory for his workers). Main Street nos: 7, 9, 11, 34, 40, 45, 47 (parts of which are over 300 years old), 49, 51, 54, 55, 55a, 115 (this was formerly two cottages), 117 (also had a small stocking shop at the top end of the row, it also retains large upper floor windows), 127, 129, 135, 143, 145 (with long upper floor windows in stocking shop at end of row), 151, 152 to 160, 153 (originally three cottages one of which would have been the home of Rev William Lee), 155 to 169 and 173 to 185. Church Walk off Main Street (formerly known as Pinchpenny Row) the whole row were knitter's cottages the one nearest the road, has long since been demolished. Factory (for seaming and finishing): 8 Shelt Hill, known previously as Dark Lane. Bank Hill nos: 1 to 9 (the long upper windows still visible in the bottom cottage). Foxwood Lane: cottages named Fox Dene and Brooklands were part of a former group of cottages. 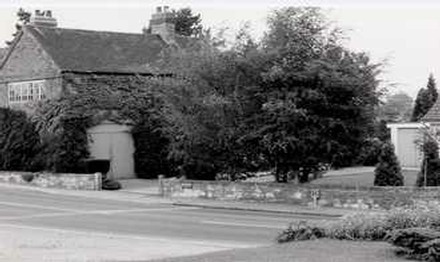 Roe Hill and Roe Lane contained the largest group of cottages associated with the industry, many now demolished such as Sydney Terrace in early 1960’s, Field Lane cottages possibly demolished at the same time. Only those at New Row Terrace (a row of 8 cottages), 1 and 2 Roe Hill Cottages, and Field Cottage on Field Lane remain today. Nearer to Woodborough, The Calverton Folk Museum, on Main Street, Calverton, Nottinghamshire, has many artefacts as well as a stocking frame. Opening is restricted to the last Sunday of each month between April and September from 2.00pm to 4.00pm, additional details from Mrs Cupitt (Tel:0115 9652836). Text mostly by Peter Saunders and David Bagley, both local historians. The article below entitled 'Stockings', first published in 1798, was re-printed in the Woodborough Newsletter of May 1968. It discusses stocking preferences of the kings and queens of England in the 16th century. There is a reference to William Lee, which states he was born in Woodborough, this is quite the most interesting part of the article, particularly for the supporters of the theory that Lee was in fact born at Woodborough and not, as some historians have subscribed to, at Calverton. There has been some doubt about Mr Lee's birthplace. For a hundred or more years, it has been impossible to prove or disprove because parish records were either stolen, lost or destroyed. Some historians have favoured Woodborough as his birthplace whilst others the nearby village of Calverton. However the following article seems to have been written with some certainty at the time of Woodborough's Inclosure 1795/98, although this might just be a coincidence. So perhaps Woodborough gets the nod, at least for the time being. [Ed 2005]. The first pair of worsted knit stockings which were worn in England, was knit by William Rider, a London Apprentice, in the year 1564, and by him presented to the Earl of Pembroke; prior to which it was customary for the Kings and Nobility of England to wear cloth hose; even Henry the VIIIth, the great and wealthy Prince, commonly wore cloth hose, excepting a pair or two of silk hose he procured from Spain. Sir Thomas Garsham presented Edward the VIth with a pair of Spanish silk stockings, which was much esteemed, and looked upon as a valuable present. Queen Elizabeth, in the year 1560 was by her silk-woman Mrs Montague, presented with a pair of black silk stockings, after which period she never wore cloth hose. In the year 1580 , the stocking frame was invented by William Lee, M.A. of St John’s College Cambridge. Mr Lee was born in Woodborough, a village in Nottinghamshire, and was heir to a good freehold estate. Tradition says, he being deeply in love with a young towns-woman, whom he courted, and always found knitting on his visits, paying, as he thought, more attention to her business than it deserved, made him determined, if possible, to contrive a machine (he having a good mechanical head) that could render the ordinary mode of knitting hose a gainless employment. This he affected, and worked sometime at the frame himself, and thus he taught his brother and other relations. He practised on his new invention for some years, at Calverton, a village about five miles from Nottingham, and either he or his brother worked before Queen Elizabeth, who was desirous of seeing the operation of this new discovery. But it seems that his countrymen despised and discouraged the invention. He in consequence took several frames and his workmen, and settled in Roan [Rouen] in Normandy, where the invention was much esteemed; but the murder of Henry the IVth and the intestine troubles of that country, frustrated all the hopes he entertained of its success. He died in Paris of a broken heart. Please read John Blackner's 'History of Nottingham' published in 1815. This section under the heading 'Trades of Nottingham' entitled 'Framework-Knitting Branch' also states that Lee was of Woodborough. It also goes on to discuss at length the framework-knitting trade. Read also what the Rev’d W E Buckland had to say about Lee and the invention of the stocking frame machine in his book, 'The History of Woodborough' published in 1896. 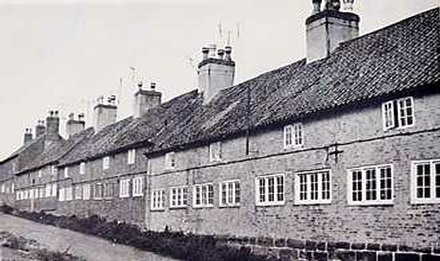 Pevsner, writing in his 'Buildings of England' series, dismisses Woodborough as "another framework-knitting village but with fewer remains than Calverton". …….